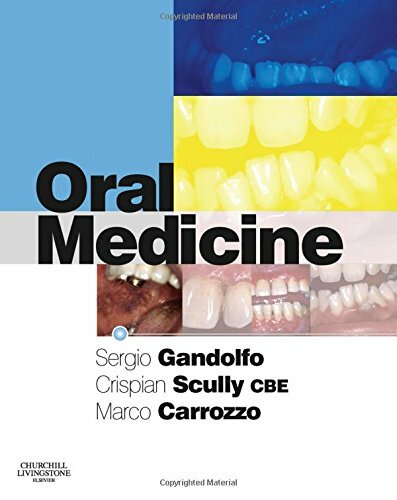 A practical and highly-illustrated guide to oral medicine for dental students and candidates for postgraduate dental exams. Professor Sergio Gandolfo, MD DDS, is Full Professor of Dentistry at the University of Turin, School of Medicine S. Luigi Gonzaga. He earned his medical degree in 1977 and completed postgraduate training instomatology (1980) and medical oncology (1983) at the University of Turin. Currently, Professor Gandolfo is Head of the Department of Dentistry at the S. Luigi University Hospital, Orbassano, Turin, and is also Dean of the Postgraduate School in Oral Surgery and the Master in Oral Medicine and Special Needs Care at the University of Torino. From 2005 to 2008 he was Dean of the Degree Course in Oral Hygiene (University of Torino). Professor Gandolfo is past-President and founding fellow of the Italian Society of Oral Pathology and Medicine (SIPMO), and a member of the International Academy of Oral Oncology (IAOO), the International Association of Oral Pathologist (IAOP) and the European Academy of Oral Medicine (EAOM). He currently serves on the Scientific Committee of the Association for Prevention and Care of Cancer in Piedmont. He has received numerous public and private funding for research in oral cancer, and has published the results of his studies - often performed in collaboration with other National and International research centers - in international journals. His research interests include the prevention and early diagnosis of oral and maxillofacial cancer, genetic imbalance in oral cancer, therapy of oral pre-cancer and cancer; non-neoplastic disorders of the oral mucosa - diagnosis and therapy of oral lichen planus and vesculobullous diseases as well as medical and surgical disorders of salivary glands and salivary flow disorders. He is also interested in the pathogenesis and therapy of oral somatoform disorders. Part 1: Diagnosis. Differential diagnosis by site. Differential diagnosis by signs and symptoms. Diagnostic flowcharts. Part 2: Clinical features. Pathology. Part 3: Therapy. Guide to the main drugs used in the treatment of oral mucosal diseases. Main drug side effects of oral and perioral localisation. Therapeutic protocols. Part4: Biopsies and vital stains. How to perform a biopsy of the oral mucosa. How to perform a toluidine blue staining.